Fresh off the news that Patrice Bergeron was named the Second Star of last week, the NHL made right in properly announcing that another Bruin was worthy of some recognition. Bruins winger Jarome Iginla was named the First Star of the NHL for the month of March, with Detroit's Gustav Nyquist earning Second Star honors and Philadelphia's Claude Giroux receiving Third Star honors. 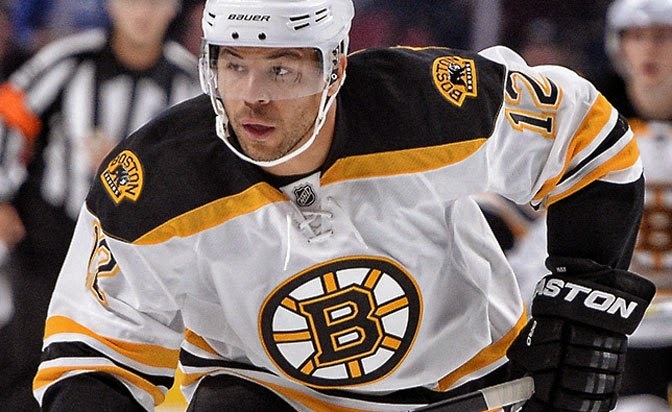 Iginla netted 13 goals and four assists for 17 points in 17 games in March. Iginla turned in four two-goal games and had five game-wining goals. Iginla had six multi-point games and maintained a plus-12 rating. His month-best six-game point streak stretched from March 9 to 18, where he tallied seven goals and one assist for eight points. Iginla also hit a couple milestones in the Month, playing in his 1300th career NHL game on March 17 when the Bruins played the Minnesota Wild, as well as passing former Bruins great John Bucyk on the NHL's all-time scoring list when he scored twice versus the Colorado Avalanche on March 21. Iginla now sits tied for 24th on the all-time scoring list with Guy Lafleur at 560. Iginla has totaled 30 goals, 31 assists for 61 points, good for second on the Bruins behind only his fellow linemate David Krejci (63 points). Iginla was one of the integral parts to Boston's 12-game winning streak last month and their currently intact 16-game point streak. His goal scoring has kept the Black and Gold freight train rolling along as the regular season winds down and the playoffs wait right around the corner.